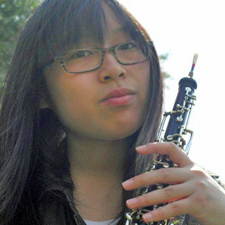 The next talented student in our blog series on our 2011 Anthony Quinn Foundation Scholarship Recipients is Tsukumo (Tina) Niwa, an oboist who hails from Fort Lee, NJ and is currently in the 11th grade at Bergen County Academies. She will be using her scholarship to attend the Boston University Tanglewood Institute: Oboe Workshop this summer. Please join us in congratulating Tsukumo and wishing her the best this summer and in the future as she builds her musical career. In the future, I would like to become a “musician.” A true musician, I believe, is someone who wholly understands and appreciates the art of music. Of course, I wish to play the oboe and improve my performance skills as long as I can. Expertise on one’s instrument is the foremost quality of a musician, but knowing the background of music and having a great personality are equally as important. My utmost respect goes to Akira Miyagawa, whom I idolize as a musician. He is a very skilled pianist, conductor, and composer – yet, what makes him truly exemplary is the depth of his knowledge in all aspects of music and culture, and his willingness to share it with everyone. Through my efforts, I strive to become this ideal, true musician that I imagine, as I consistently stay hungry for more musical knowledge. I truly love listening to classical music in my spare time. One of my favorite things to do at home is to blast out some massive and dramatic orchestral pieces, such as Mahler or Tchaikovsky symphonies, when no one else is home. In school, I often visit the band room, pick up random instruments, and start playing them. I have “jammed” on French horn, trombone, bassoon, alto sax, bass, tuba, and even timpani – although people around me do not enjoy my horrible and tuneless playing, I have fun! Although my main interest is in music, I extend my artistic interest in other forms of art, too. I have taken classes in filmmaking, acting, photography, art history, and stagecraft. My school has “academies,” in which students get to focus on one area of study while taking all academic courses at honors or AP/IB level. I am in the Academy for Visual and Performing Arts, with concentration in music – I take some music-related courses, such as AP Music Theory, MIDI Workshop, Music and Society, Musicianship, and Class Piano, all of which I truly enjoy. Click here to hear Tsukumo playing Haydn's "Oboe Concerto in C," recorded in November 2011. For more of Tsukumo's recordings, visit her YouTube channel.